Our own brand of durable and easy to dispose of puppy training pads. 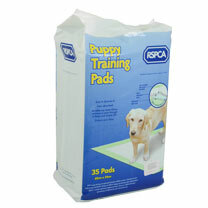 We recommend them for hygienically housetraining young puppies and suitable for senior dogs too. Pack of 35, 60 x 54cm.